After returning from an extended period of travel, in our case driving a van to South America for 18 months, one forms a desire to obtain items which would never fit in a backpack and that anchor you to a new home. For some people, it may be an impractically heavy coffee table or perhaps a canoe, but me, I wanted a skateboard ramp. Let me be clear, my skateboarding experience more or less ended at the age of 10 with a quarter-pipe of improperly set nails, and a doorway of flesh swinging open on my knee, but the desire to be a part of this fascinating sport and culture never left me. So as a brave 37-year-old husband does with any questionable home project, I waited for my wife to leave town for the weekend and built a 4ft mini-ramp in the backyard of our rental property. Initially, I convinced other non-skaters of my vintage to get together under the title of “Gentlemen’s Halfpipe”, where we adorned all forms of armour prior to attempting the simplest of tricks. With time the ramp moved indoors, and talented skaters joined in on what became regular Friday night sessions of boardslides, bonelesses, beer, and punk rock mixtapes recorded from YouTube with a cheap tape deck. 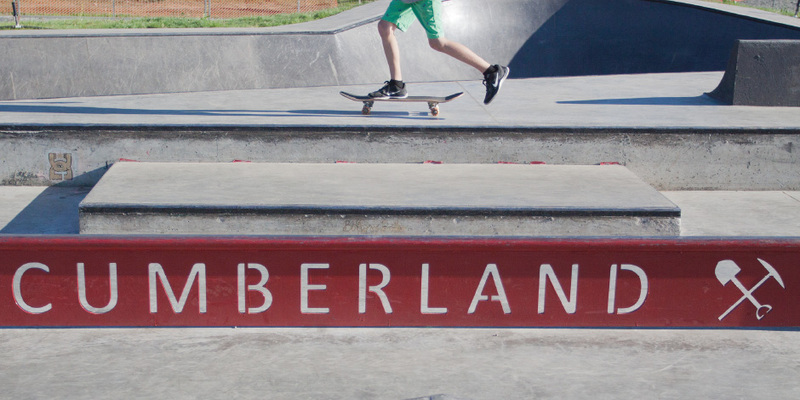 At one of these sessions, the idea of a Cumberland skatepark was born. 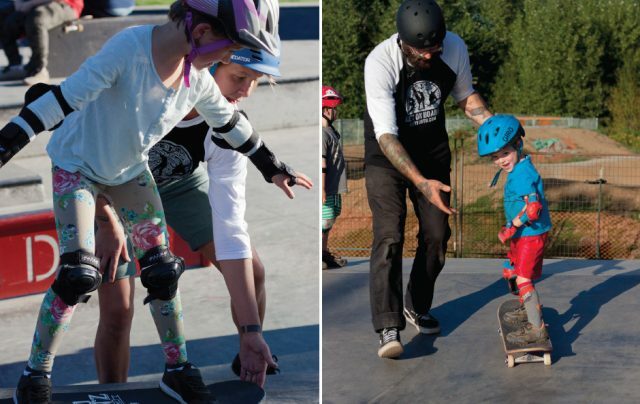 The Comox Valley is fortunate enough to have three other skateboard facilities: the Lewis Centre Skatepark built in 1994, and both the Linc Youth Centre and the Lerwick Skatepark completed in 2006. Unfortunately, if you are a youth in Cumberland without transportation to these amenities, skateboarding can be impossible. With this in mind, we formed a skatepark committee and pitched the idea to a council who were instantly supportive of the project. Soon after, a partnership with the Cumberland Community Schools Society was formed. Because of their enthusiasm and drive, as well as the natural connection to Cumberland’s youth through the CCSS Youth Centre and extensive after school programs, it was the perfect match. The project developed over four and a half years, with incredible support from the CCSS and the Village of Cumberland, and with extensive community engagement and fundraising. Youth and adults were involved in the design process via open houses and participated in fundraising activities including welded donation jars created by Chris Armstrong and his talented Vanier shop students that were placed around town to collect community donations. The skatepark opened in July of this year and has been an overwhelming success, continuously packed with kids aged 2 to 45. Skateboarding in the Comox Valley goes well beyond local skateparks. Get on Board (GOB) is a Comox Valley based registered non-profit organization that uses board sports: surf/skate/snow and SUP, to develop social skills, self-confidence, and goal-setting in youth. GOB projects (gobyouth.com) include: the construction of a skatepark in the remote First Nation of Ahousaht, half pipe construction at K’omoks First Nation and We Wai Kai First Nation, and a partnership with the John Howard Society to work with youth who’ve come into conflict with the law, teaching them to build skateboards. This summer and fall, GOB skate mentors will work with youth at the Cumberland Skatepark teaching park etiquette and board skills. “GOB encourages inclusivity in its programming,” says Grant Shilling, Chairman of Get on Board. Shilling is an outreach worker with the homeless and has a physical education degree. He has worked with diverse populations including the Gaza Surf Club, Maple Pool United street soccer team, and penned the Cedar Surf: An Informal History of Surfing in BC. Shilling hopes to see more women and girls participating in skateboarding, “It’s a bit of a mystery as to why there are so many women who surf on Vancouver Island but relatively few female skaters,” says Shilling. To encourage this growth, GOB will employ several female skate mentors as part of the lessons in Cumberland and elsewhere. GOB views a skatepark as a social circle where other activities can be developed. These include artistic activities such as skatepark murals, musical activities like DJ mentoring, and cultural activities including First Nations teachings and environmental awareness. The Do-It-Yourself ethic of board sports is encouraged by GOB through board and pipe construction and through work on the former Forbidden Plateau ski lodge, where a graffiti gallery of immense beauty has emerged on the walls and cement slabs have been jigsaw puzzled into skate ramps. GOB will advocate for the preservation of this imaginative transformation and foster further development of the skatepark at Forbidden Plateau. Shilling says, “Teaching youth skills such as board building, ramp building, and park etiquette, hands control of the activity over to the young–where it belongs,” and we couldn’t agree more.